Drinking isn’t always easy – we may be too busy, we forget, we drink coffee in place of water. When we make it to the office, our whole day becomes filled with meetings, emails, and projects. We become so occupied that staying hydrated just isn’t in our list of priorities–let’s change that! If your day is full of meetings, you are most likely familiar with the useful calendar app on your phone or email. Setting routine reminders or alarms on your calendar phone can help ensure your hydration levels are kept at a consistent level. Better yet, you can add “bring water bottle” on your meeting notes for extra measure. Work challenges motivate us to accomplish goals we wouldn’t otherwise complete without the right motivation. Finding a coworker or friend that can keep tabs on you, and vice versa, can make staying hydrated a fun part of your day. You can also add prizes to make things interesting or stick to the bragging rights. The average adult needs to drink eight 8 ounce glasses of water a day (more if you’re active). If this number sounds too high for you, shoot for an extra glass than you would normally drink. The purpose of setting a goal is to create something that you can accomplish, thus, building a roadmap to success. This one may be more involved than the other tips but if done right, it can be very helpful! You can make this as easy as making notes on a piece of paper or downloading a water drinking app. 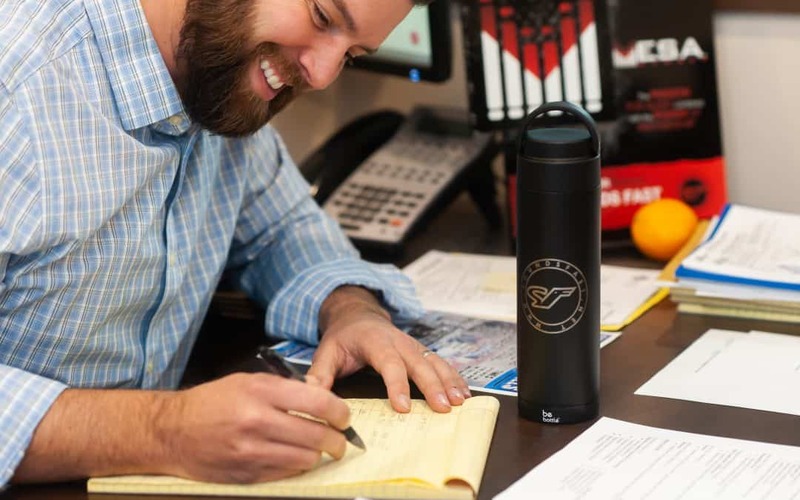 Whatever your method may be, tracking your water intake is a great way to monitor your hydration throughout the work day. There are different ways to stay hydrated at work. Hopefully, one of our tips can be applied to your day-to-day and help you achieve your hydration goals!